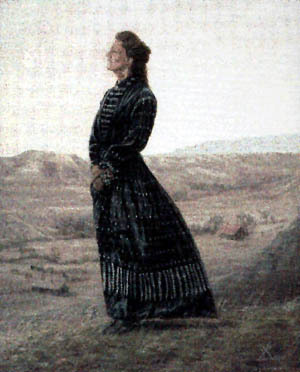 "BELLE" This is a painting of Belle Drewry who was featured in the painting "The Woman in Blue" by L.D. Edgar. In this painting she is picking flowers on a hill above "Rosie's" (another painting by L.D. Edgar). This is a limited edition of 50 prints signed and numbered by the artist. The image size is 11"x14". print comes mounted on archival foam core ready for framing. The price is $250.00 plus $30.00 shipping.